Curio Bay is in the southwest of the Catlins in the Southland region at the bottom of the South Island of New Zealand and is an accessible place to visit turning off the Southern Scenic Route, SH92 road from Balclutha to Invercargill. The Bay is the location of a fossilised forest and some rare New Zealand wildlife such as the endangered New Zealand Yellow-eyed Penguins. The environmental and geological attractions at Curio Bay are what draw visitors and one of the main attractions is the petrified forest, dated to the Jurassic period at 180 million years ago. The ancient tree fossils that once were a living forest in Gondwanaland are now recognised one of the best examples of Jurassic forest in the world today and a site of international importance. Petrified wood such as this forest is extremely rare and only occurs under certain circumstances. This Petrified Forest existed even before birds. Other fossils such as plants, leaves, and sea animals can also be seen. 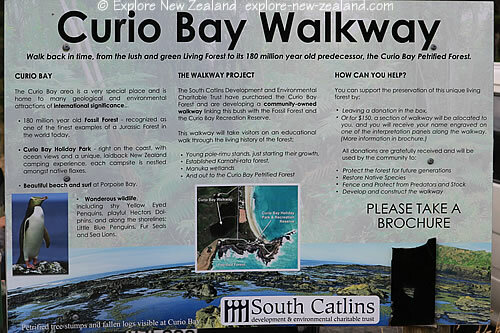 The South Catlins Development and Environmental Charitable Trust purchased Curio Bay and have been working towards preserving the site alongside providing education and attractions for visitors. This work includes building of the Curio Bay Walkway that runs from the Curio Bay Recreational Reserve living forest, all the way to the Petrified Forest. As you approach the Petrified Forest there steps going down past educational display boards providing a wealth of information about the bay. 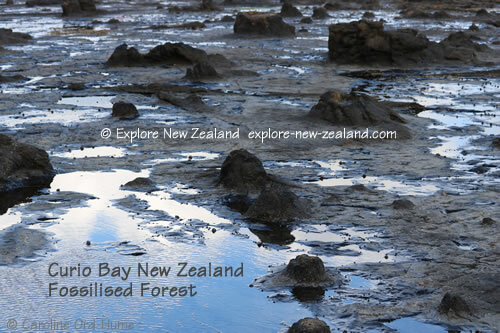 The information tells you; how the Curio Bay fossilised forest was formed and by what processes, what has happened to make the forest visible for us to see now and its significance in the world today. The work of the trust is aiming towards the following, some of which I has been completed or is ongoing, and is being maintained going forward. There used to be much more of the remains of this ancient forest than there is now. Unfortunately over the years people have taken bits of the petrified wood and it has gradually reduced in size. The tree stumps were higher than they are now. Although there are signs asking visitors not to remove anything from the site, there are always the few people who do take material from the forest and ultimately will spoil the site for future generations if it has to be closed off to the public. 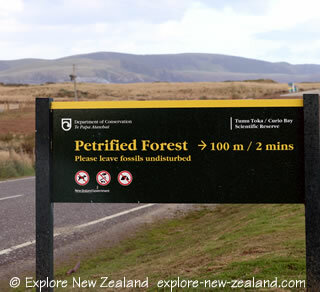 Please follow the requests on the signs and do not take anything from the petrified forest so it does not have to be closed off. 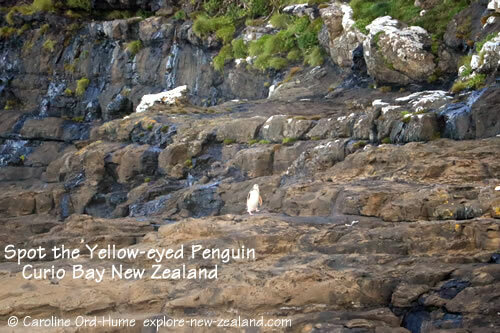 Curio Bay native New Zealand wildlife includes Hector’s Dolphins / papakanua, Yellow-eyed Penguins / hoiho, New Zealand Fur Seals, New Zealand Sea Lions, and other marine wildlife and birds can be seen at Curio and nearby Porpoise Bay, both of which are in the Catlins. Wildlife attractions include watching penguins returning from the sea to their nests at the end of the day and in the breeding season you may be lucky to see them feeding their young. Fur seals and sea lions can be observed, usually lazing around on the rocks and dolphins can be seen in nearby Porpoise Bay. There were quite a lot of herons in the bay when I was there, and other birds fishing in the sea or looking for crabs. Some birds of sea and bay you may see are; torea/oystercatcher, herons, tuturiwhatu/dotterel, tara/tern, duck, kotare/kingfisher, shags, sooty shearwaters, and the amazing crested spoonbills. There is a Department of Conservation Ranger in place at Curio Bay, usually to protect the penguins during breeding season. You will see a welcome board about the ranger with a photo so you can identify him or her. The ranger will be only too happy to answer any questions you have about the wildlife. 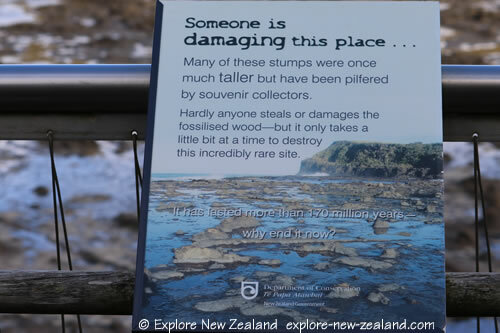 In New Zealand it is an offence to harass or disturb native wildlife so please take a moment to read the information boards detailing safe distances from wildlife to ensure they are not disturbed, and sometimes for your own safety. The guidance, or rules in some cases, is in place to protect the wildlife while maintaining your enjoyment of it. It is a privilege to be able to watch wildlife in its natural habitat so please ensure you follow the guidelines so that the birds and animals do not have to be fenced in to protect them from humans and their domestic pets. Absolutely keep dogs away from wildlife at all times and particularly away from penguin nesting areas. Also remember that potentially aggressive seals and sea lions as they are large predators and can be dangerous, they may see you and/or a dog as a threat. 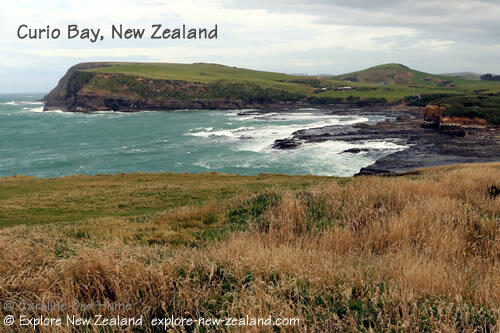 There is a campsite between the Curio Bay and Porpoise Bay with tall patches of New Zealand Flax providing shelter from the winds for tents, campervans, motorhomes, and caravans. And believe me you do need shelter from the wind at this location in the Catlins! From the Southern Scenic Route SH92 you turn down Niagara Waikawa Road, then turn right at Waikawa and go approximately 7km down the Waikawa Curio Bay Road. At Curio Bay you turn left to get to the campsite and Porpoise Bay, or right to get to Curio Bay and the Petrified Forest. For access to Porpoise Bay, follow the road through/past the campsite and you will find a parking area, toilets, and a small campsite shop. On the Niagara Waikawa Road you pass through the small settlement of Waikawa on the edge of Waikawa Harbour where you will find; Waikawa Museum, the Dolphin Information Centre, and St Marys Anglican Church. Waikawa Museum doubles as a visitor and information centre along with providing visitors with an insight into the history of the area. Southern Scenic Route SH92 runs from Balclutha to Invercargill in Southland New Zealand and goes right through the Catlins.